Nothing makes a better gift than something personalized! Prominently featuring any text you desire, the design is permanently carved into the surface of the glass resulting in an elegant frosted white appearance. We use a premier method of sandblasting, which produces a deep and even mark on the finished product. Each product is hand made by our talented team and individually quality checked before being shipped. Our glasses are restaurant quality and made by Libbey Glass. They hold 16 ounces, stand at just over 6" tall and are dishwasher safe. Please note that we will adjust the sizing and placement of your engraving to best fit the style of glass and overall layout. In order to achieve the optimum appearance on the final product, font sizes may vary from the product preview panel during customization. You do not have to fill out all four available lines; only one line is required for purchase. 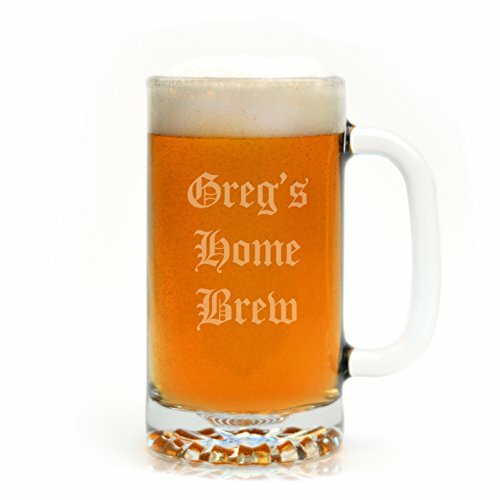 Customize your engraved beer glass with anything you desire! We often etch humorous phrases, serious remarks, drinking quotes, event details etc. We have you covered for any birthday, wedding, bachelor or bachelorette party, anniversary, award presentation or retirement gift. A decorated glass makes a perfect gift for mom, dad, husband, wife, brother, sister, friends and many more! Engraving is permanently carved into the surface of the glass, making this a truly unique present. Our fast turnaround time means you can order your glassware last minute!